A wide angle photo of a wedding ceremony at Our Lady of Grace Church in Highland, Indiana. On the wall at Kristen and Greg's home was a photo frame that said "Live. Laugh. Love". Their November wedding ceremony at Our Lady of Grace Church and the subsequent reception at The Patrician certainly lived up to that motto. I played roving reporter at Kristen's home as her mom and bridesmaids got ready for the day. she has wonderful tall ceilings there and we were able to take her dress along with slinky black bridesmaid's dresses and arrange them for a group shot. I also took details shots of her rings as well as the silver and green wedding shoes. A bridesmaid group photo on a balcony with dress hung beneath them. Wedding rings placed together on a wooden dresser top. The first moment to evoke happy tears was when Kristen's girls including her mom and sister read a heartfelt note address to them. I ran about the room as they read her words and looked for her to express their gratitude. Sister of the bride tears up while reading the bride's handwritten note. A brides sits in her tiara on her November wedding day. Wedding dress hanger with the bride's married name. A father gets a first look at his daughter, the bride to be in her wedding dress. A bridal portrait of a lovely brunette bride. After the first look with Dad, I took off for Our Lady of Grace Church in Highland, Indiana where I took formal pictures of the groom, his family and the groomsmen. The groomsmen pose in the pews of Our Lady of Grace Church in Highland, Indiana. This was a very large wedding and I knew the hall would be filled due to the amount of attendees at the church as Kristen came down the aisle with her Dad. A bride walks down the aisle with her Dad at Our Lady of Grace Church. The bride and groom share a smile during their wedding ceremony. The flower girl takes a nap during a wedding ceremony. Men in kilts play bag pipes at a wedding at a Catholic church. Growing up in the Highland area and having her wedding there as well, we decided a stroll through the downtown area would make for nice shots for the wedding album. We also used the wonderful scenery in the church as well. The groom kissed the bride underneath her veil. The bride and groom go nose to nose in this cute wedding photo. The bride and groom pose for a night time portrait in downtown Highland, Indiana. 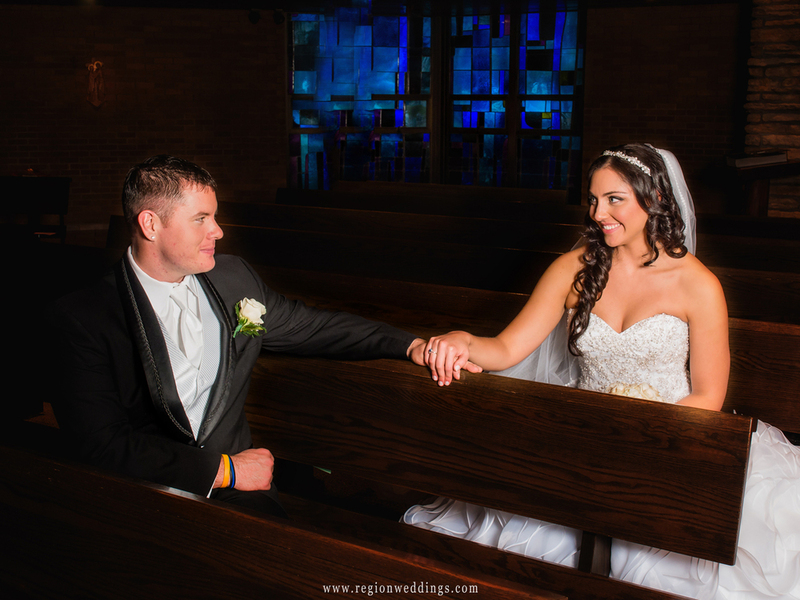 The bride and groom gaze at each other lovingly as they sit in the pews at Our Lady of Grace Church. Wedding party poses on the steps to the band shell at Highland Park. I don't think I can call what took place at The Patrician that night a "reception". It was a flat out party - green themed candy buffet, heartfelt speeches from the matron of honor and best man - oh, and fire and smoke too!! Guests sign the guest book at The Patrician banquet hall. The bride and groom enter the ballroom into fire and smoke. The bride whispers into the grooms ear during the first dance. I hope you have enjoyed this sneak peek look at Kristen and Greg's November wedding at Our Lady of Grace Church in Highland, Indiana. Stay tuned here of the Region Weddings Facebook page for more updates. 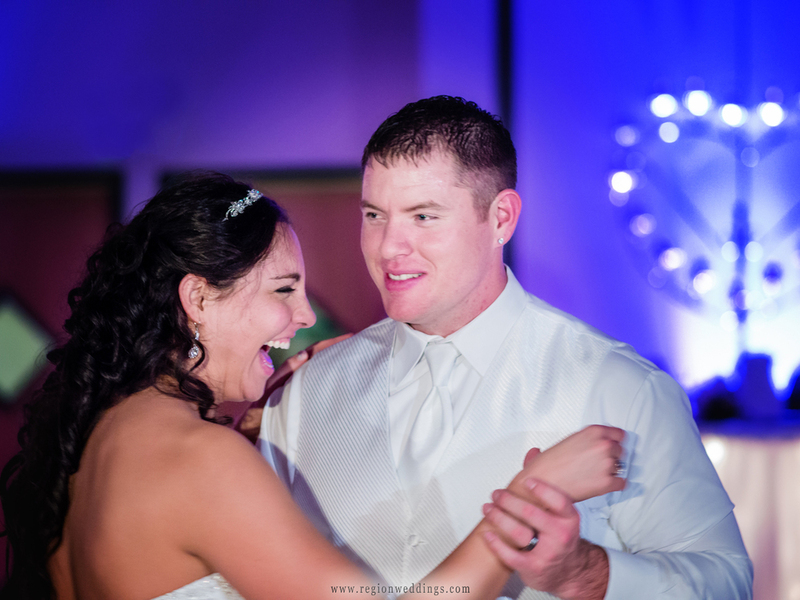 The bride breaks out into laughter during her first dance with her new husband.